Most granola is filled with lots of carbs and sugar that make it anything but a health food. 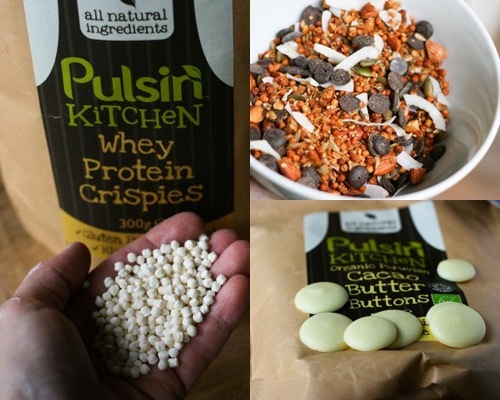 This high protein granola uses Pulsin Whey Protein Crispies combined with jumbo oats to pack a protein punch and an awesome crispy texture. This isn’t super sweet – I use a bit of honey and no sugar or dried fruit – but seriously you won’t miss it. 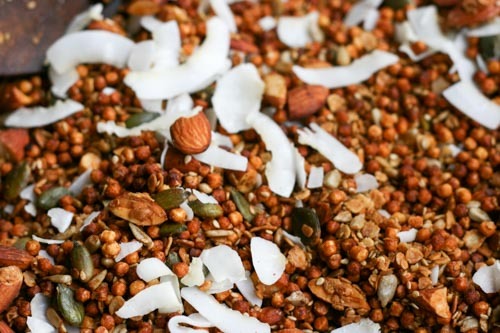 Preheat oven to 300 F / 150 C.
On a big baking sheet or roasting tin, mix together the oats, protein crispies, nuts, sesame seeds, salt, cinnamon, ginger, and nutmeg. Whisk together the egg white, honey or agave, and the oil. Pour over the dry ingredients, mix thoroughly, and spread evenly across the baking sheet. Bake for 30-40 minutes, stirring every 10 minutes, until the granola is golden brown and dry. Let cool (it will crisp as it cools). Mix in coconut and serve. You’ll notice that this recipe uses Pulsin’s Cacao Butter Buttons for the oil (don’t go eating them like chocolate drops as we did when they first arrived). You can of course substitute coconut oil, olive oil, or other fat of your choice. 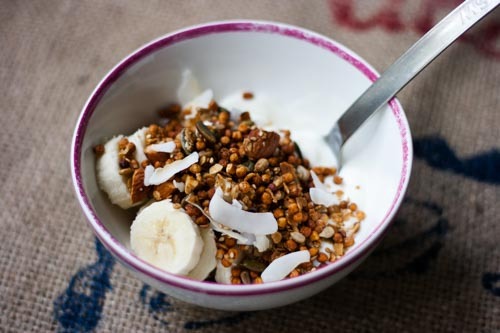 I personally like to have my granola with yoghurt and sliced banana! 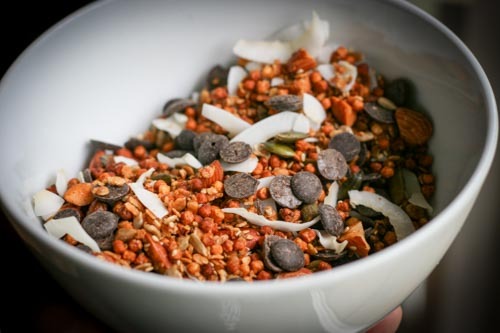 For a more traditional granola recipe, checkout my awesome Christmas granola! 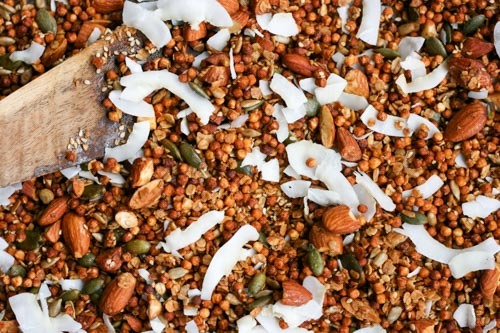 So pretty – and I do so agree about most granola being far from healthy.